The HS-20 Series Headspace samplers from Shimadzu represent a major revolution in the development of GC with Headspace systems for volatile component analysis. 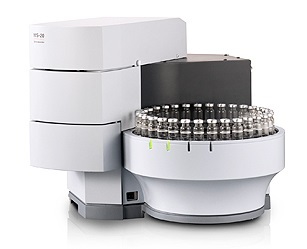 The HS-20 can be easily coupled to the world-leading Gas Chromatographs and Gas Chromatograph-Mass Spectrometers from Shimadzu to provide unique solutions. The system achieves high reproducibility through both high-accuracy flow rate control via the Advanced Flow Control (AFC™) system and a mechanism that allows sample vial to enter the oven from the bottom, thereby minimizing heat loss and maintaining high thermal stability during overlap analyses. The HS-20 sample tray is 20 cm higher than the desk, making sample placements easy; the 10m and 20 ml vials can be easily handled in the tray without any special attachments and with the optional barcode reader the samples can be logged in automatically eliminating human errors. The system achieves the best ‘’carry-over’’ specification in the market, thanks to the superior design of the inert sample line which results in residual solvent concentrations less than 0.0001%. With an oven configurable up to 300 Deg C the system is ideal for analysis of high-boiling compounds too. High sensitivity analysis of volatile compounds in coffee, aromas etc.